Apple Pie is a holiday classic. 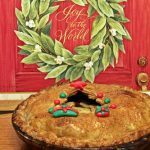 This recipe takes it to the next level with decorations on the pie crust! 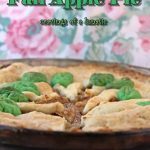 Apple Pie is such a classic holiday recipe. 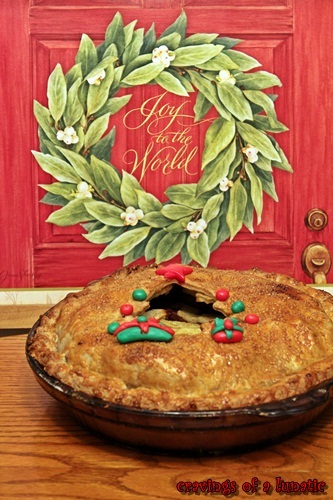 I cannot imagine celebrating Christmas without an apple pie on the table. This recipe definitely kicks it up a notch. Welcome to day #5 of Christmas Week, a multi-blogger event co-hosted by yours truly, and Jen of Juanita’s Cocina. Today’s theme for Christmas Week is “Christmas Pies and Pastries”. Make sure you visit all the participating bloggers today to see what special dish they whipped up for you. Today is the final day of Christmas Week. While it has been a ton of work to post every day I am going to miss doing this. It’s been so much fun sharing Christmas ideas with you all. I’ve also really enjoyed working with all the wonderful bloggers who were involved. There is nothing like blogger bonding. I adore these ladies and am so proud to count them among my friends. To me that’s what holidays are all about. Celebrating with people you love and adore. There’s nothing better than that. I made apple pie in true Lunatic Christmas style. A normal pie would be too well, normal for me. So I turned to Family Feedbag for pie inspiration. 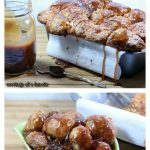 Amy’s site never lets me down for pie ideas. The woman is a pie wizard. A pie guru. A pie genius. Seriously make sure you stop by and see how she decorates her pies. You will be blown away by her creativity. For the pie recipe I turned to the one and only Paula Deen for inspiration. I wanted to try a new recipe. I tend to make my own often but wanted to step outside my normal and try something new. So the recipe for the dough and the filling is inspired by Paula, the queen of cooking and baking. 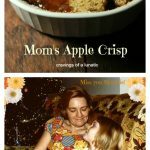 This woman’s recipes rarely fail me. When I’m tired and not feeling my own creative juices flowing Paula is the one I turn to for help. She brings it every time. The woman is a dynamo. I am determined I will meet her one day. It’s likely I’ll pass out when she says “y’all”. Just warning you now in case any of you are standing in the line of fire as I hit the ground. So there’s a fun twist to today’s #ChristmasWeek post. We’re giving stuff away. Not just any stuff. Cool stuff. Stuff you get to pick yourself. How freaking awesomely fantastic is that! Are you ready for it? Are you sure? Okay you might want to sit down now. Freund Container & Supply has generously donated $100 gift certificates for each #ChristmasWeek blogger to give away! Giveaway is now CLOSED! Congratulation to Ann, our Freund Winner! Freund Container & Supply is the largest distributor of glass bottles, containers and wholesale packaging supplies online. Freund offers over 5000 items in stock every day, 98% same day shipping and low-price guarantees. Take a look at Freund’s wide selection of jars, tins, bottles and vials for all your crafting and food related needs! Be sure to visit today’s blog posts from each of the other #ChristmasWeek bloggers! 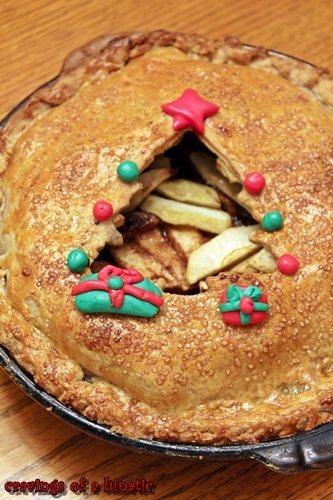 A festive apple pie perfect for Christmas! In a food processor or stand mixer (my method of choice) combine the flour, salt, sugar and mix. Slowly add the ice water a little at a time to get the desired consistency you want. Mix just until dough comes together. Do not overwork the dough, it makes tough crust. Remove the dough from your mixer. Separate into two pieces. Wrap in plastic wrap and pop in the fridge for about 1 hour. In a large mixing bowl combine cinnamon, nutmeg, sugars and the flour and give it a quick mix. Then add the apples, then toss them to coat with dry ingredients. Set aside. Remove dough from fridge and roll out first one. Lay in a pie plate you've sprayed with non stick spray. Cut off excess from edges. Pour apple mixture into the pie plate over top the first piece of dough. Roll out second piece of dough. Cut out a tree. Lay that piece of dough over top of the pie plate. Crimp your edges. Place pie in the preheated oven for about 50-55 minutes. Remove and let cool, if you can. I usually demolish it before it gets a chance to cool. 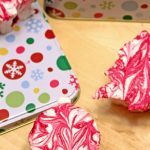 If you've allowed it to cool you can dress it up by rolling little pieces of coloured pie dough or fondant over top for the ornaments, star and prezzies. Serve with a big old "I'm a pie geek and I like it" smile! You can make your own vanilla salt or just use regular salt. I have a weakness for all things vanilla. Normally I would not use fondant on pie since fondant belongs on cake but I wanted the colour to pop and doing it with the pie dough just was not doing it for me. The colours were not vibrant enough. I figured no one really eats fondant any way so people would just pop them off. It’s just there for the “purty” factor, not for taste. Geez us food bloggers are a weird bunch aren’t we. Who dresses up pie with fondant. Clearly I need my head examined. 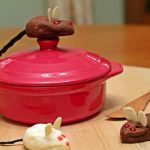 But first I want to add some fondant to my roast beast m’kay. I hope you enjoyed Christmas Week as much as I did. It was a whirlwind but so worth it. I’ll be having a recap tomorrow for anyone who found us late. So make sure you tune it. I’ll also be sharing my Mixed experience with you all this weekend. Look forward to sharing the chaos and antics with you. I’m not entering the giveaway, but I did want to say, thank you darling…for allowing me to be a part of this! Happy day #5! Thanks Jen. I have had a blast and cannot wait to do this again! Thanks so much Hester. I had so much fun making this. It’s just too cute. 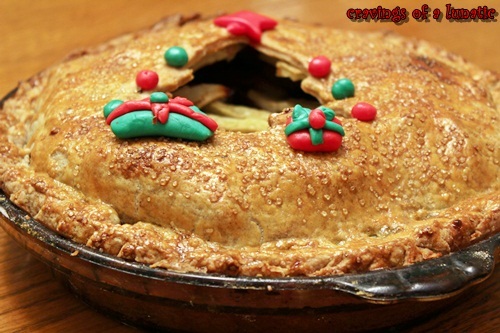 What a yummy, Christmas-y apple pie! It’s so cute! Oh, good idea. I love making extracts. 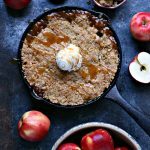 Hey, I love your different take on the classic apple pie! It’s very Christmasy. If I won, I would buy glass jars for crafty purposes. Maybe those little canning jars to bake some pies iN them. Thank you. Full credit to Amy of Family Feedbag for inspiring me. Love baking pies in jars. I did apple ones and cherry. They freeze nicely too so you can pop one out at a time for dessert. I’m following you on twitter @julie_ketchup. Oh good choice Barbara. Good luck. I think that’s an awesome choice. I’d be buying a lot of glass bottles, probably the amber ones, for my homemade vanilla. I’d also get some of the French square bottles. Both gorgeous choices. Good luck. I love your pinterest handle. I lke Freund on Facebook. I follow Freund on Pinterest (jodoobers). I’d like to see Shepherd’s pie or cottage pie in mason jars! Your wish is my command. Lol! Comment on Freud’s Facebook page. I would love using the Amber Round Glass Bottles for making vanilla extract. Great for presents too! I think they would be perfect for that. This is an awesome giveaway! I’m into canning in a HUGE way right now and I adore their Squat Bulb Gourment Glass Jars. AWESOME! I think I’d order as much as the gift certificate would allow! Thanks so much Ann. I was super stoked to work with Freund. They have such cool stuff. Good luck lady. Thanks so much Ann. I was so stoked to work with this company. They have such cool stuff. Good luck lady! You KNOW I’m an email subscriber! ….and I’m a Pinterest stalker, too! You know you’re awesome! ….and I’m a twitter stalker! Thanks Uru. I had so much fun making it. and I’m a fan of your Facebook page. A HUGE fan! I’m also a fan of Freund on Facebook! ….and I follow Freund on Facebook! I also follow Freund on Twitter! Tweet, tweet! …and last, but certainly no least, I now follow Freund on Pinterest! Thanks to both of you for an amazing giveaway and a GREAT week of sweet treats! I want the amber boston round bottles with dropper, like your apple pie. Awe thanks so much Heather. Thanks for being so dedicated and making such awesome goodies. It’s been so much fun. Thanks for including me this week – it was lots of fun! 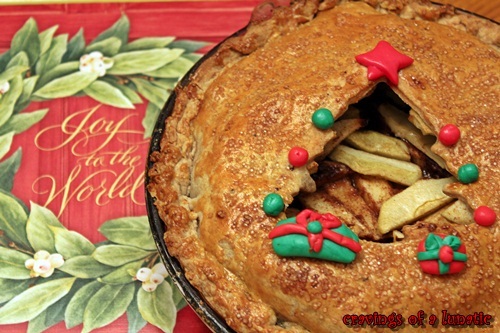 What a gorgeous pie, love the festive touch! Thanks so much for joining us Erin. It was such a pleasure to have you involved. Thanks, this was so fun to make. I completely agree John. Pie is most definitely a food group. Always love when you visit. This pie is so cute, love the cutout! I stalk you every way possible, you know that! Thanks so much Joan. I love stalkers. You did it, dude (just had to call you dude!)! Thanks so much for including me…even though it was a crazy week, I was so glad I joined in. I hope you have some naps planned for the weekend. You deserve a little R and R.
Thanks dude. I am so thrilled you joined us. Could not have done it without your goodies. Thanks. I had fun playing with the swag. It’s addictive. I love the glass syrup containers!! Me too, they are fabulous. Good luck. I would get the plastic snap lock containers!! vanilla salt is totally new to me but apple pie is an old favorite. Best of luck with this series – it’s clever. I love vanilla salt, use it in everything. Great for baking. Thanks so much Maureen. Jam would be awesome. I need to make some. I was eyeing those myself. Thanks so much Cathy. I am so honoured you joined us. I would love to have you work with us again. It was so much fun. I need bottles for making vanilla. Thanks so much Rita. Glad to have another pie lover here. Id use it for my Canadian maple syrup!! Oh I love that. You rock. Smores in jars would be heavenly! Oh that would be heavenly. Thanks so much for inviting me to join in this fabulous week of treats. I think I gained ten pounds just reading all of the posts! You know, I had never thought to decorate a pie until you introduced me to coloring dough and now you have gone a step further with fondant. I love it!! I can also vouch for Ann’s canning frenzy. She gave me a gift of her bounty. She is such a dear. Now I have to jump on board and get my canning persona out of hibernation. I am so happy you joined us Kristen. It’s been so much fun. Loved seeing what everyone came up with. And I hear you. Christmas is not helping the waistband. I get a little crazy in the kitchen. It’s like an obsession to come up with weird ideas for baking. Lol. I think I need to sample Ann’s goodies. I was stunned when she told me all the stuff she canned. So impressive. I laughed my head off at that. Thanks for the giggle. You made me giggle so seems fitting you giggled too. Love stalkers. Thanks for the Freund follow. That would be awesome. Great idea. I like you on Facebook and I said Hello!!!!!!!!!!!!!!!!!!!!!!!!!!!!!! I’d buy the Amber Swing Top Bail Wire Glass Bottles for homemade vanilla extract. Saladgoddess following Freund on Twitter. If I won, I’d go for the wire-bale air seal jars, probably in different sizes. I like them for storing baking supplies. I’d get the food grade plastic buckets and some gamma lids to go with them! Always such a treat to see what you been up to with your cooking and baking.